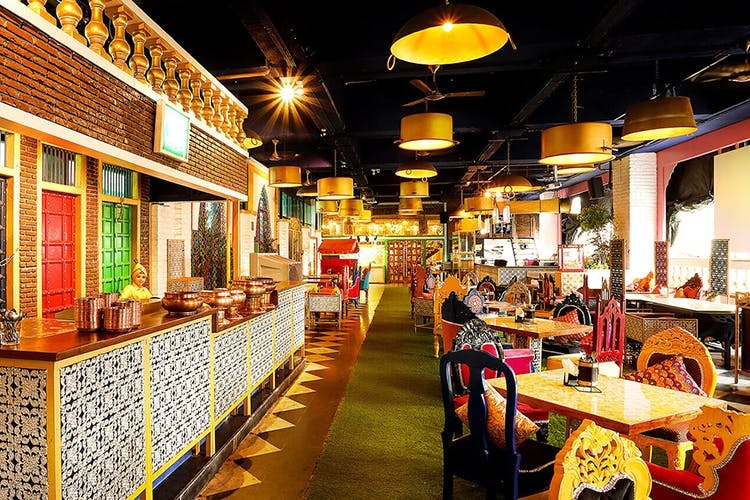 Mumbai's popular North Indian restaurant, Taste Of Punjab has opened doors in Pune at Trade Net Building in Viman Nagar and here's everything you need to know. Taste Of Punjab has a spectacular ambience. It's quirky, it's eccentric and it's vibrant. There are colours everywhere; checkered flooring, multi-tone, throne-line chairs, live food kiosks, flashy golden hues, bright chandeliers and sparkly drapes. The vibe is quite happening too. We love the bhangra music out here that's always on loop. There is an awesome dance floor too where you can let loose. When it comes to food out here, we'd highly recommend you go for their scrumptious buffet that comes with salads, soups, two kinds of rice, kulcha and roti and a main dish made of either mutton, chicken or seafood. Of course, vegetarians get the mix-veg or the paneer options. Additionally, there are live counters too that dish up some mouthwatering raan biriyani, chicken dosa and stuffed paranthas, right in front of you. Alcohol at Taste Of Punjab is an extensive affair. Their cocktail selection is quite vast, so take time while choosing your drink. We particularly recommend you try the black Scotman - a drink made of whiskey, Kahlua and coke that goes perfectly with a belly-filling dinner. We hear they serve alcohol at MRP at their Mumbai outlets. Hopefully, they'll start doing the same in Pune too. Night owls, don't miss the midnight buffet out here, between 11.00 pm and 1.00 am, for just INR 399.